Once in a while a production comes along which is darn near close to perfection. 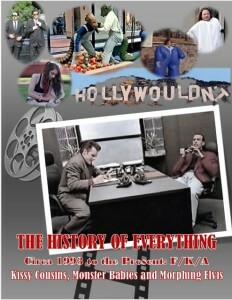 A theatrical piece that weaves together the starting points of marvelous text, catchy songs, and toe-tapping music with the creative processes of a masterful director and choreographer, multi-talented performers, and a spot-on production team, and ultimately yields a polished, striking final product. It is a work that keeps you engaged from beginning to end – and often is one you truly don’t want to come to an end. 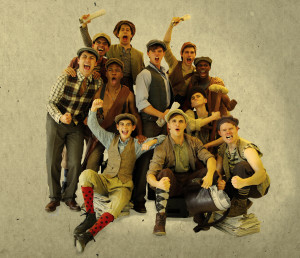 Connecticut Repertory Theatre’s (CRT) incarnation of Disney’s Newsies is an exemplary case in point. 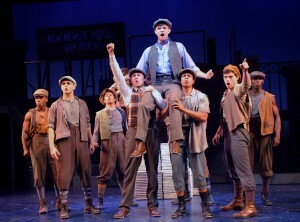 Based upon the real 1899 Newsboys Strike in New York City, this heartfelt story with music by Alan Menken, lyrics by Jack Feldman, and book by Harvey Fierstein premiered at the inimitable Paper Mill Playhouse in 2011 before transferring to Broadway in 2012, where it went on to receive eight Tony nominations and two wins for Best Choreography and Best Original Score. CRT brings it to their boards for their Nutmeg Summer series under the artistic direction of Terrence Mann and is directed and choreographed by Christopher d’Amboise with Equity actors Jim Shubin, Tyler Jones, Richard R. Henry, and Tina Fabrique alongside UCONN’s and other advanced theatre students. 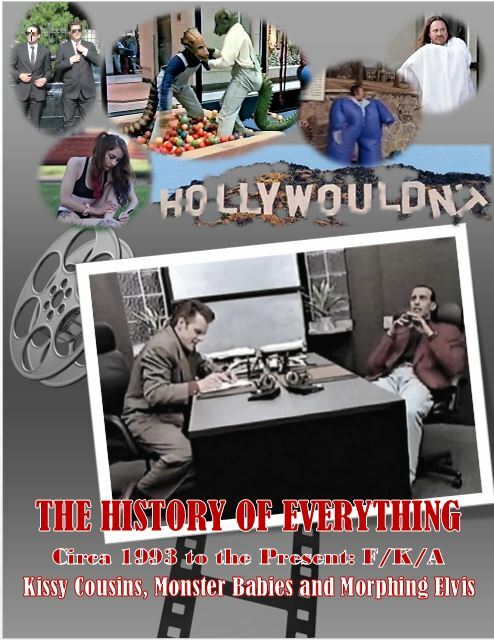 Ultimately you’d be hard pressed to know the professional from the amateur, with each actor bringing out the very best in every other to create pure stage magic. Down and out “freelance” newspaper delivery boys begin each morning selling the New York World “papes” for mere pennies, until one day they’re faced with an unfair hike in their upfront purchase price by greedy publishing magnate Joseph Pulitzer. An impossible situation for the mostly orphaned and homeless newsies as they are known, they feel their only hope for fairness is to band together and have a voice. They decide to organize a union and then a strike led by the charismatic Jack Kelly with the help of his disabled best friend Crutchie, and two newcomers to the city streets, brothers Davey and Les. Journalist (and Jack’s love interest) Katherine Plumber plans to assist by giving them plenty of ink in a competitor’s paper. Newsies is playful, urgent, and entirely relevant. It is a David-and-Goliath story which parallels many of today’s social injustices – and it shows us that an underdog truly can be mighty. It illustrates how strength of conviction, power in numbers, and the potency of dreams may be the only leverage we need as we strive for justice and a better life. Newsies also showcases the incredible triple-threats of all of its cast members in incredible acting, singing, and dancing. Jack Kelly played by Jim Schubin is excellent as the sometimes brusque and most certainly charming leader of the pack. Tyler Jones as his best friend Crutchie is both ebullient and endearing. Noah Keiserman is a terrific Davey, the bookish brother who must set out to help his family in their time of crisis, while keeping tabs on younger sib Les, a plucky Atticus L. Burello who’s just naïve enough to find the life of a newsie alluring and exciting. Tina Fabrique is a fantabulous Miss Medda Larkin, the larger-than-life singer and Bowery star who offers support and sanctuary for Jack and his pals. Richard R. Henry is the man you love to hate, Joseph Pulitzer, who’s out only for himself, money, and “The Bottom Line.” Songbird Paige Smith’s Katherine Plumber is feisty and aside from her commitment to give the little guy a voice, she also represents the revolt against sexism in industry. Kalob Martinez is excellent as the contemptible Snyder, the crooked head of the vile “refuge” where orphaned boys are sent so that he can collect his government checks. There are no small roles in this sizeable cast – each and every contribution must be noted. 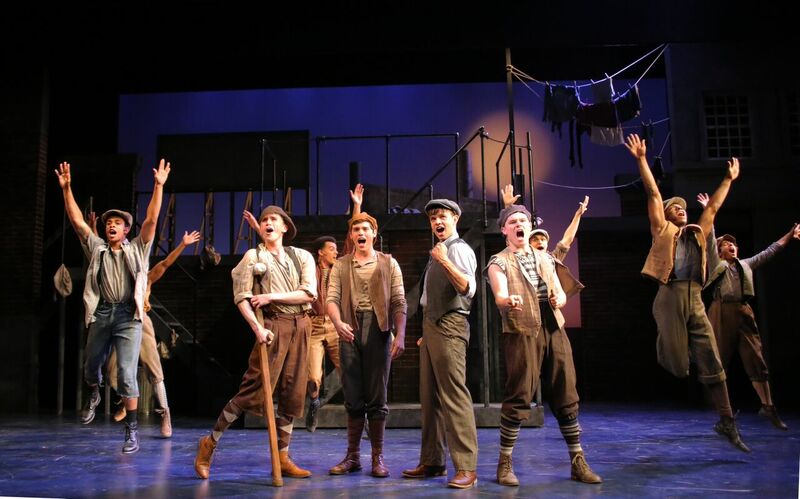 Shout-outs to: Tuck Sweeney as Race; Aaron Bantum as Albert; Jacob Burns as Specs; Dharon Jones as Henry; Spencer Croy as Finch; Simon Longnight as Romeo; Brendan Engman as Scab 1, Police, and Citizen; Kent Coleman as Scab 2, Police, and Citizen; Jamal Fields-Green as Spot Conlon and Citizen; Alessandro Gian Viviano as Morris Delancey; Cullen Ries as Oscar Delancey; Alyssa Sarnoff as Hannah, Nun, Dancer, and Citizen; Jane Zogbi as Nun, Dancer, and Citizen; Nate Healey as Governor Teddy Roosevelt, Nunzio, and Police; Will Bryant as Wiesel, Police, and Mayor; and Aidan Marchetti as Seitz and Jacobi. Christopher d’Amboise directs the ragtag bunch with a keen eye and delightful choreography to a rousing and completely exuberant end result. A hand also goes to Kelly Crandall d’Amboise for additional choreography. Equally as enjoyable is the top-notch set design by Tim Brown, rivalling any Broadway construction. Also exceptional was lighting design by Michael Chybowski which both subtly and powerfully denotes tone and action. Kudos to NDavid Williams for music direction, Tom Kosis for stage management, Fan Zhang for spectacular costume design, Michael Vincent Skinner for sound design, John W. Parmalee for technical direction, and Pat McCorkle with McCorkle Casing, Ltd. Final shout outs to the orchestra: Christa Conway, violin; Seth Lisle, bass; Jeanne Pocius Dorismond, trumpet; Jim Lendvay, trombone; Phil Plott, reed; Tyler Campbell, percussion; Tom McDonough, keyboard 1, conductor; and Charlie Savage, keyboard 2. 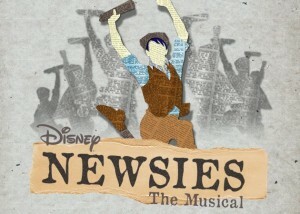 As this was my first experience with Newsies, CRT has set the gold standard deeply within my gray matter. I truly cannot imagine a livelier, more professional production. Like a newsie with his last pape in hand, I’d wholeheartedly recommend that you get your tickets before they’re completely sold out! 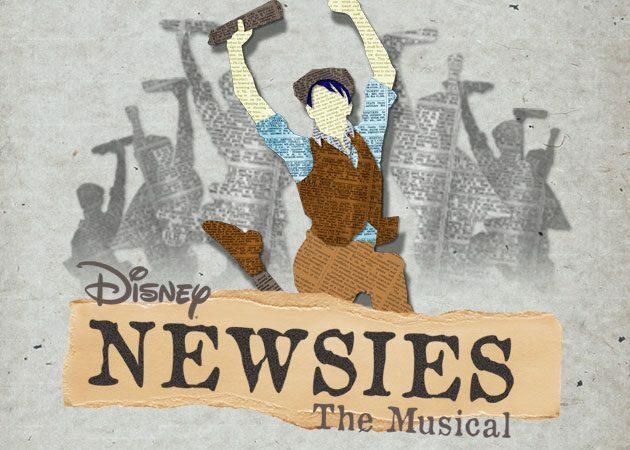 Due to a recent hospital stay, I was unable to write my usual comprehensive review of CRT’s Newsies — So here is my “abridged” version with a big DITTO to everything my wife and co-reviewer said above. EXTRA! EXTRA! Read all about it! 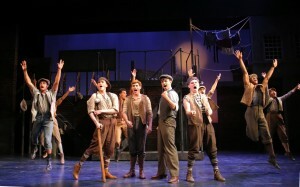 CRT’s Newsies is an unqualified hit! In fact, Newsies is the third gem in CRT’s Triple Crown of their summer Nutmeg Series under the artistic direction of Terrence Mann. Talk about horse racing analogies, all three summer plays — 1776, Noises Off, and Newsies — were thoroughbreds and I believe it was a dead heat at the finish line for all three! So kudos to Terrence Mann, Vincent Cardinal, Christopher d’Amboise, and Matthew Pugliese!